Every week Peter King’s Monday Morning Quarterback has a “Stat of the Week”. 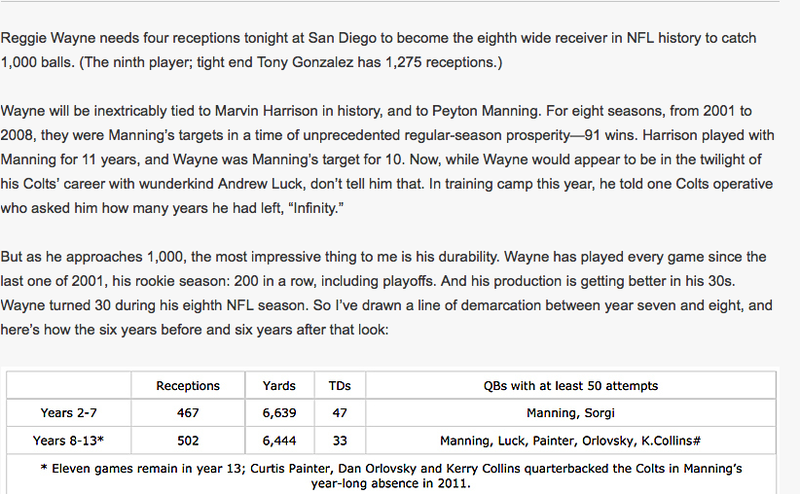 Today’s “Stat of the Week” looks at Reggie Wayne and how the 13-year veteran has continued to put up Hall of Fame numbers at a time when most players production dwindles. Very good article and as I look back at them years something came to mind. Is how Reggie made lots of things happen for the Colts success, as much as anyone. Above all he has done them behind the scene. As a future hall of fame player, Reggie led in leadership, unselfishly by walking the walk he did it on the field day in an day out. Reggie could have went to another team for money to seek a selfish platform but he stayed to be a part of Colts future and past. Thanks Reggie for staying a Colt for more memories!!! I agree, love Reggie for staying around with our Colts!